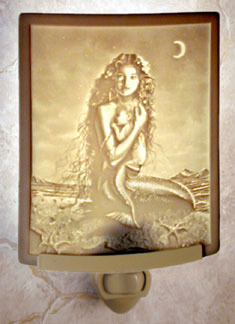 This Lithophane Mermaid & Child Translucent Porcelain Night Light will light up the corners of your home with unique beauty. First invented in France in 1827, a Lithophane ("Vision In Stone") is a porcelain engraving that virtually comes alive when illuminated from behind. A breathtakingly detailed picture in warm sepia emerges when light passes through the different thickness of the porcelain panel. These illuminated artworks are so detailed, that they are sometimes mistaken for photographs! To create a Lithophane the design is first carved in wax, using a light table as guide to help our artist see the image as he works. A mold is made from the carving, and then porcelain is pressed into the mold. The dried porcelain is finished by hand and high fired in a kiln to 2300oF, and then each piece is inspected carefully under a light. This high temperature firing makes the porcelain nonporous, durable and beautifully translucent. The gradual transition from thick to thin produces a truly amazing range of delicate shadings. Each Lithophane is a magical work of art, which casts a gentle spell on all those who behold it! Our exclusive clip mounting allows our Night Lights to be plugged into any electrical outlet, including outlets that are installed sideways or upside down.